This flower has a touch of mystery and legend. In translation from the Greek chrysanthemum - "golden-colored". It has a strong positive energy, being a symbol of the sun. 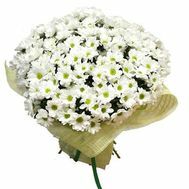 The birthplace of this flower is the Celestial Empire, where the seeds are bred since the middle of the 6th century BC. 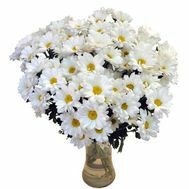 An old legend says that after learning that a potion of longevity and endless youth is being prepared from chrysanthemums, the emperor of China sent for them 300 young people to the island. Moreover, the best, clean soul and kind heart were chosen. However, none of those who saw the flower could break it, so it was beautiful. Boys and girls remained on the island, which later became the Land of the Rising Sun. Now chrysanthemum is a symbol of this state. It can be seen on the banner, the highest order, coins of Japan, on the clothes of members of the imperial family. Russia recognized these flowers only at the beginning of the 19th century. 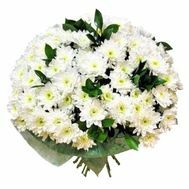 Since then, chrysanthemum bouquets have become a part of many festive events. These amazing flowers please their splendor almost all the year round. And even on the street they grow up to frosts. 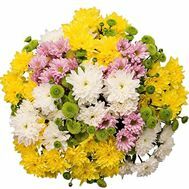 A variety of colors, from gentle to bright, makes bouquets of chrysanthemums, unique. By the way, thanks to the abundance of shades, you can create a floral composition for any age. 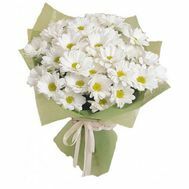 Romantic girls like chamomile chrysanthemums are suitable. Venerable ladies are presented with amazing yellow flowers, symbolizing longevity. 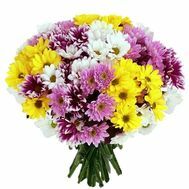 A multicolored mix of chrysanthemums, and they can be from eleven to fifty-five, surely will improve the mood, plunging loved ones into the atmosphere of love. 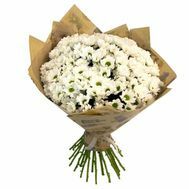 By the way, in our online store, professional florists will realize any of your floral fantasies. 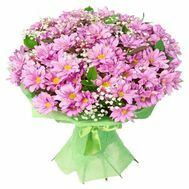 And fast delivery of bouquets from chrysanthemums will allow to surprise relatives or friends with an incredibly beautiful composition. For example, wicker baskets with chrysanthemums, associated with the village, meadow, emerald grass look great. 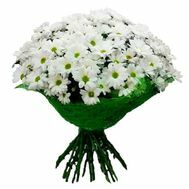 Chrysanthemums are very nice to give, above all, because of their long-lasting freshness. 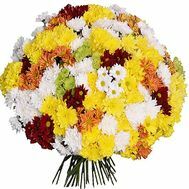 You can not worry that the delivery of flowers to anywhere in Ukraine will grieve the drooping bouquet. 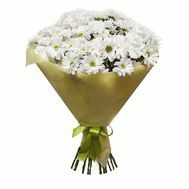 Chrysanthemum - a win-win option for different life events. 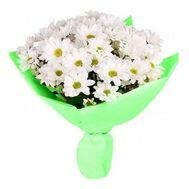 So, if you want to impress your lover, give her a large bouquet of chrysanthemums. You can also order it for a special occasion. 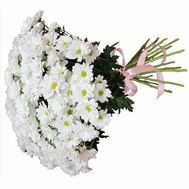 Delivery of flowers in the form of such a chic bouquet can not leave anyone indifferent. Our online store will satisfy the most exquisite tastes of customers. 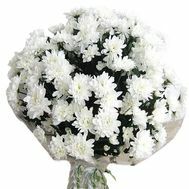 A magnificent bouquet of chrysanthemums of white color can please your beloved woman. 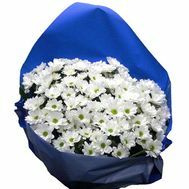 Of the blue flowers of this species, an unusually beautiful wedding bouquet turns out. A strict geometric composition is suitable for a proud man with ambition. 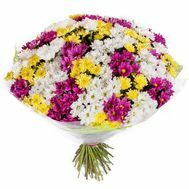 In any case, this is accompanied by the delivery of bouquets of chrysanthemums, making the gift timely and meaningful.